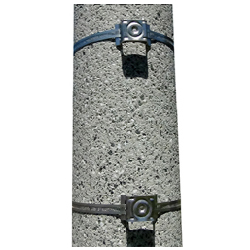 Sign Mounting Worm Clamp Adjustable Stainless Steel Strapping for Large Diameter Poles and Light Standards, Flared Leg Brackets and Hardware will Mount One Sign. Fits 4" -12" Diameter Poles. Hardware is sold in pairs, as most signs have two pre-drilled holes for mounting. Requires a screwdriver or wrench to install. Hex Head Bit and Drill is recommended. (2) Stainless Steel Straps - Length 9/16" x 40"